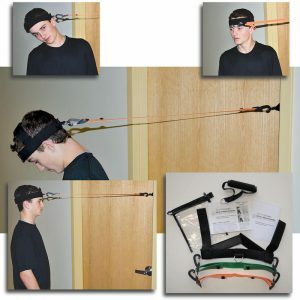 Modular Neck Exercise Tubing For The Head Harness Exerciser Provides Upgrades In Strength For Progressive Resistance Neck Muscle Training. 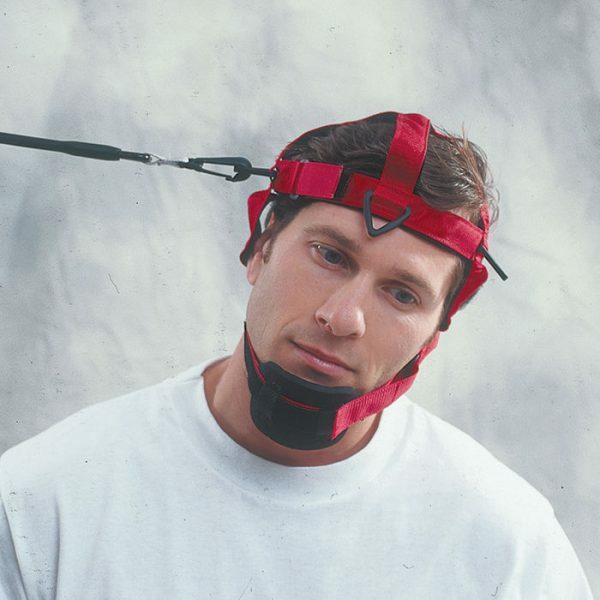 The Head Harness Neck Exerciser Comes With The Burgundy Tube (1.5 – 4.5 Lbs Resistance). If And When You Are Ready, You Can Upgrade To New Levels Of Strengthening. We Suggest Using The Burgundy Tube 4 To 6 Weeks Prior To Progressing To Higher Strength Levels. Or Follow As Prescribed By Your Doctor Or Therapist. 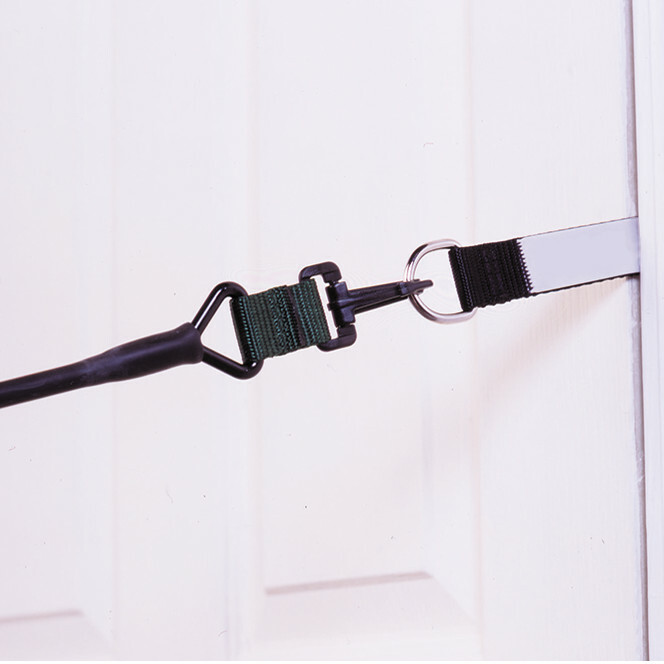 This Is For The Tubes Only, You Still Use The Head Harness And Door Mount That Comes With The Complete Modular Neck Exercise Kit. The System Uses A Sturdy, Color Coded Modular Tubing For Safe And Effective Rehabilitation And Strengthening Of Neck Muscles. The Tubing Is A Single 2 Foot Section Design Along With Sturdy Fittings. The Standard Tube Clip Ends Are Plastic. The Higher Resistance Blue And Black Use Metal. Contains Natural Rubber. 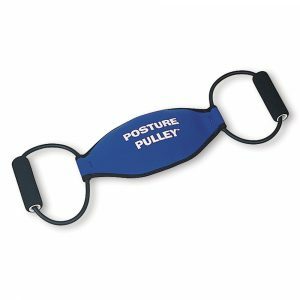 The Head Harness Neck Exerciser comes with the burgundy band (1.5 – 4.5 lbs resistance). When you are ready, you can upgrade to new levels of strengthening. 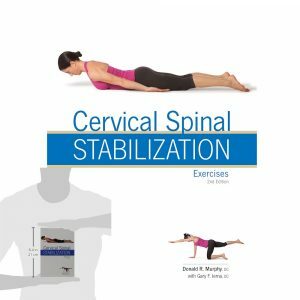 We suggest you use the basic kit for 4 to 6 weeks before progressing to a higher strength levels of neck exercise tubing to give you time to get used to the system and the exercises, allowing the muscles to reach this level of strength. Or follow as prescribed by your doctor or therapist. 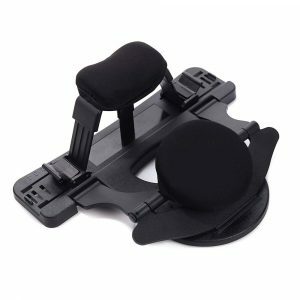 This is for the tubes only, you still use the head harness and door mount that comes with the complete modular neck exercise kit. The system uses a sturdy, color coded modular tubing for safe and effective rehabilitation and strengthening of neck muscles. The tubing is a single section design along with sturdy fittings. 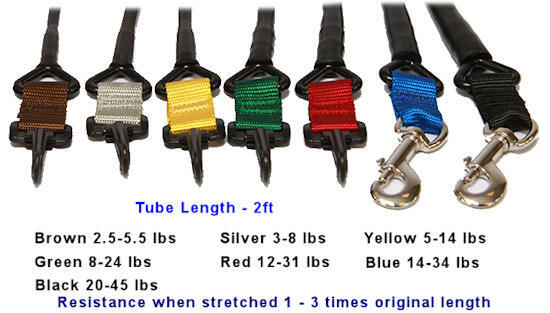 The standard tube clip ends are plastic, except the higher resistance blue and black, which use metal. Contains natural rubber. The tube is 2 feet in length stretches up to 3 times the length and when used within these parameters, will not snap. Strengthening through progressive resistance training will challenge your neck muscles with strong counterforce resistance tubing. 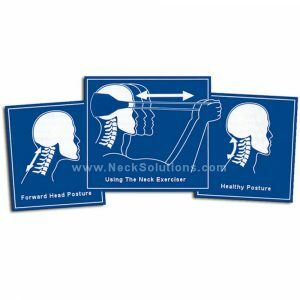 By progressively increasing resistance, you make the neck muscles stronger. 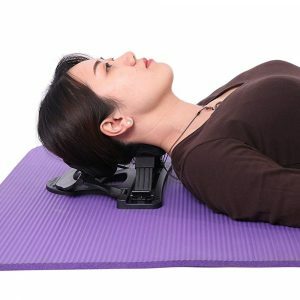 This exerciser system will increase muscle mass, tones the muscles, as well as strengthens cervical spine bones. It not only can be used to alleviate pain and rehab injuries, but also helps maintain superior strength needed everyday home and work activities. Generally, strengthening exercises should be done a minimum of 2 times a week. A set typically consists of 8 – 12 repetitions of each movement, working up to 2 -3 sets per movement. The muscles should have 48 hours for recovering from each strength training session. 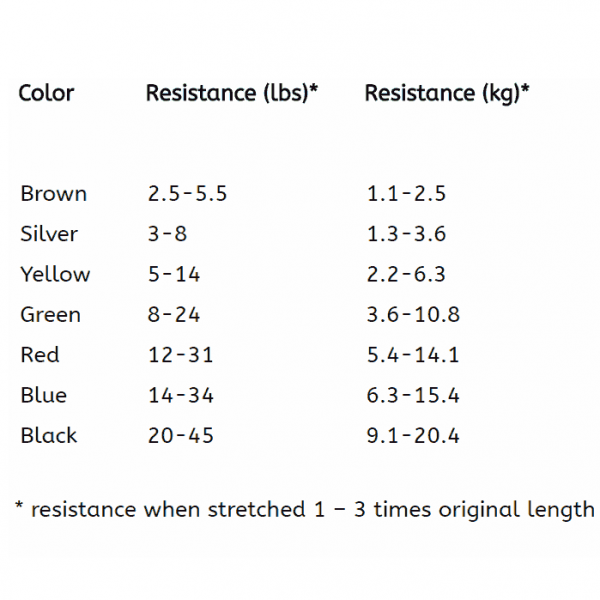 Resistance In Pounds: Brown (2.5 – 5.5) | Silver (3 – 8) | Yellow (5 – 14) | Green (8 – 24) | Red (12 – 31) | Blue (14 – 34) | Black (20 – 45). 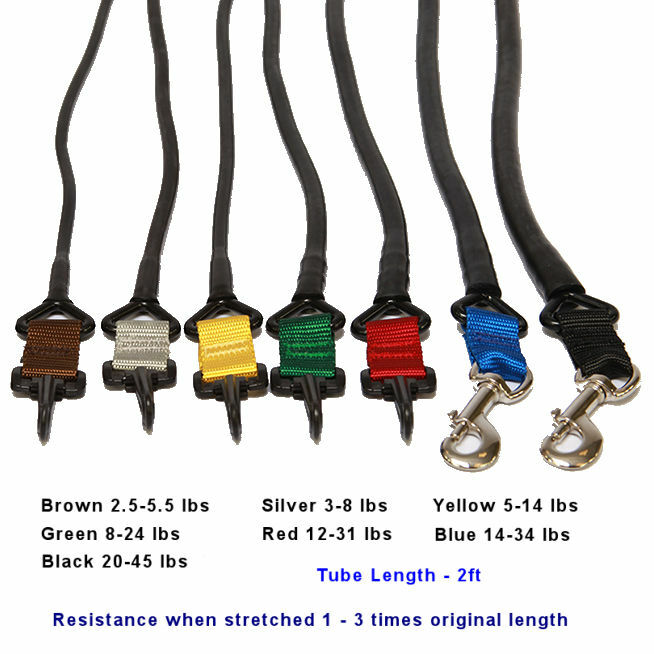 Remember, the tubing stretches 1 to 3 times in length, so the resistance is user controlled and variable. It is a smooth force and ranges of strengthening are able to be used. 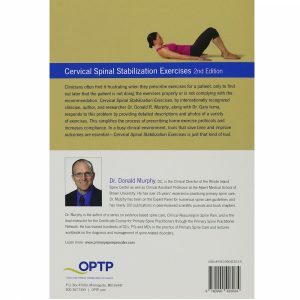 For general postural re-education, it is normal to use more force in extension than flexion for the typical person with neck pain due to forward head posture. This does not mean you need 2 bands for each flexion and extension, however, by increasing the tubing stretch, you can get more force. 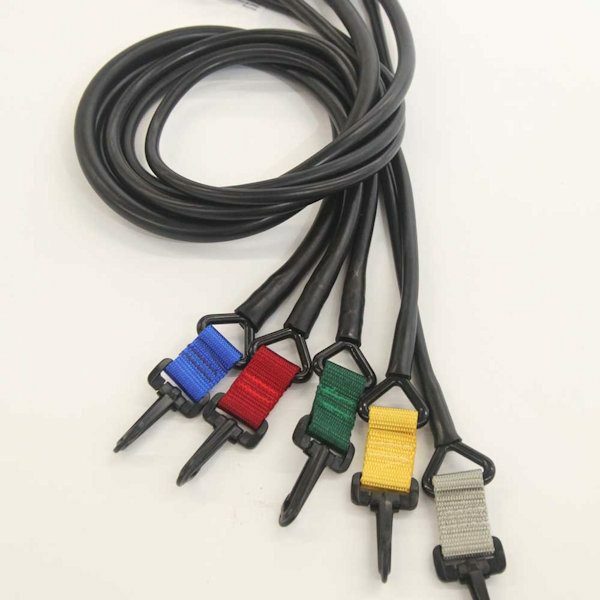 While you want to increase overall strength of the muscles in all ranges, the advantage of neck exercise tubing over weights with a head harness is variable, user controlled force with one or more tubes.